HONOLULU (14 Oct. 2016) The Western Pacific Regional Fishery Management Council, in Honolulu today, agreed to the drafting of amendments and regulations to the Hawai‘i and Pelagic Fishery Ecosystem Plans (FEPs) to accommodate provisions of the August 26th Presidential Proclamation that expanded the Papahānaumokuākea Marine National Monument to encompass the entire 200-mile US exclusive economic zone (EEZ) around the Northwestern Hawaiian Islands. In accordance with the proclamation, the amendments would prohibit commercial fishing for federally managed precious corals, crustacean, bottomfish, pelagic and coral reef species. The regulations may allow non-commercial fishing and native Hawaiian traditional fishing practices including subsistence fishing and regulate other activities as appropriate. The expanded Papahanaumokuakea Marine National Monument prohibits commercial fishing in about 61 percent of the US EEZ around Hawai‘i. 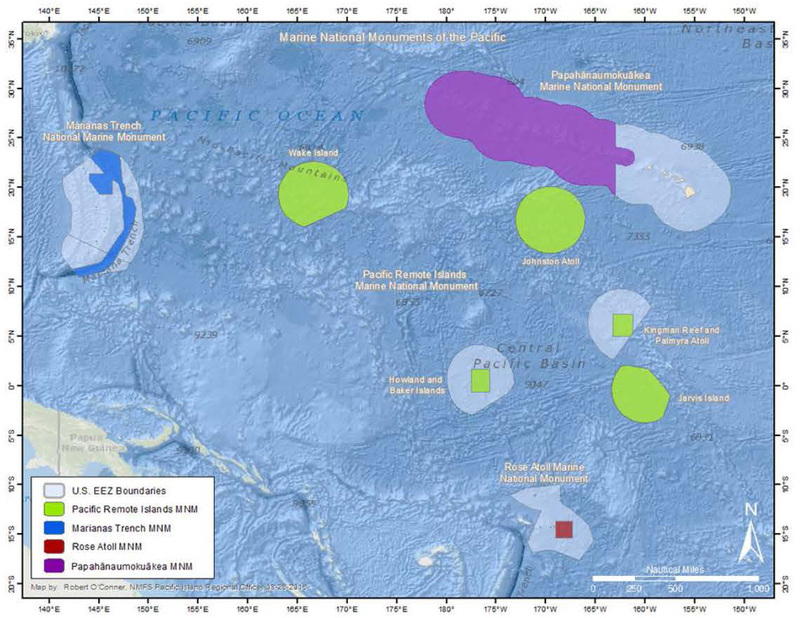 Marine national monuments now comprise 1.06 million square miles of US EEZ waters in the US Pacific Islands. The Council will solicit public input on the draft FEP amendment and draft regulation options through statewide meetings to be held prior to the Council’s next meeting in March 2017. 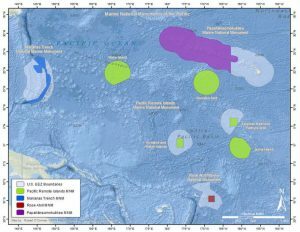 The Council will also ask the National Marine Fisheries Service (NMFS) to analyze various impacts of the monument expansion, which closed commercial fishing in approximately 61 percent of the US EEZ around the Hawai‘i Archipelago. Among these is the change in longline effort around the main Hawaiian Islands in relation to changes in troll caught yellowfin tuna. Petition to list giant clams under the Endangered Species Act: The Council recommends that NMFS evaluate the status of giant clam populations across their geographic range and not just in the US Pacific Islands, if NMFS determines in its 90-day finding that the petition may be warranted and moves forward with a status review. Navigational buoys in the Commonwealth of the Northern Mariana Islands: The Council will work with the CNMI Department of Public Safety to determine funding options to support the deployment of navigational buoys at the channels in Saipan, Tinian and Rota. Department of Defense activities in the Mariana Archipelago: The Council will ask the Department of Defense to explore the possibility of “splitting” usage at Farallon de Medinilla, CNMI, similar to W-517 in Guam, whereby fishing can occur in unused portions of the training area and to broadcast the military training “Notices to Mariners” on VHF channel 2 to provide greater outreach to fishermen in Guam. Council officers for 2017: The Council elected Ed Ebisui Jr. as chair; Christinna Lutu-Sanchez as American Samoa vice chair; John Gourley as CNMI vice chair; Michael Duenas as Guam vice chair; and McGrew Rice as Hawai‘i vice chair. For more information, go to www.wpcouncil.org, email info@wpcouncil.org or phone (808) 522-8220. Western Pacific Regional Fishery Management Council: Secretary of Commerce appointees from nominees selected by American Samoa, CNMI, Guam and Hawai`i governors: Michael Duenas, Guam Fishermen’s Cooperative Association (Guam) (vice chair); Edwin Ebisui Jr. (Hawaii) (chair); Michael Goto, United Fishing Agency (Hawaii); John Gourley, Micronesian Environmental Services (CNMI) (vice chair); Christinna Lutu-Sanchez, commercial fisherman (American Samoa); McGrew Rice, commercial and charter fisherman (Hawaii) (vice chair); Dean Sensui, film producer (Hawaii); Archie Solai, StarKist (American Samoa) (vice chair). Designated state officials: Suzanne Case, Hawai`i Department of Land & Natural Resources; Ruth Matagi-Tofiga, American Samoa Department of Marine & Wildlife Resources; Richard Seman, CNMI Department of Lands and Natural Resources; Matt Sablan, Guam Department of Agriculture. Designated federal officials: Matthew Brown, USFWS; Michael Brakke, US Department of State; RADM Vincent B. Atkins, USCG 14th District; and Michael Tosatto, NMFS Pacific Islands Regional Office.